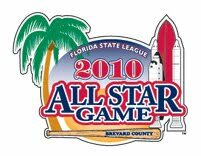 Henry Wrigley won the Home Run Derby prior to the Florida State League All-Star Game. Wrigley defeated Quincy Latimore from Bradenton to take the home run crown. YAY!!! So excited for you BIG WRIG!!!!! He got 4 HR's to his opponents 3, also a first inning fielders choice RBI.